I recently saw this hot necklace on Halle Berry, which she wore during an interview on NBC’s Nightly News to discuss her work with the Jenesse Center – a shelter for domestic violence victims. 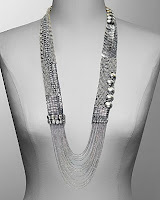 This stunning necklace is from a designer called Fiona Paxton. It's a hand-beaded metal patterned necklace with swags of fine chain references the ancient patterns of east and west, interlocking to create statement costume jewelry that is both modern and contemporary. This picture shows it in oxidized silver but it also comes in gold and light silver. In this economy it is a little pricey at $300, but the holidays are coming and you deserve a nice little present from your significant other. It's available at http://www.bloomingdales.com.